Badminton Camps in Tallinn, Estonia! 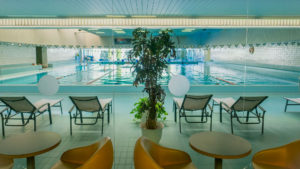 We invite you to organize your next badminton camp in Pirita Hotel & Spa *** in Tallinn, Estonia. The hotel is located on the seashore. 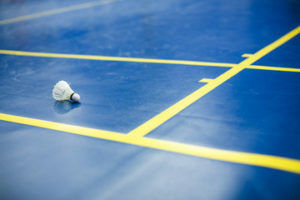 Badminton courts are located in the hotel building, an indoor swimming pool and saunas are also located in the same house. Forest jogging track (skiing track during the winter) is located 600 m from the hotel. Next to the hotel is a marina for yachts. Transfer from and to Tallinn Airport, Tallinn Harbour or Tallinn Bus Station. Pirita Hotel & Spa is a spa providing a wide selection of health, beauty and wellness services. 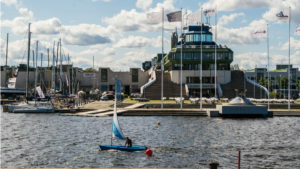 The hotel is located in Tallinn, Estonia and is well-known for its Olympic history. The heart of the city is just a 10-minute drive from the hotel. Sports hall with 4 Pro Court badminton mats is located in the same building as the hotel. Ceiling height in the sports hall is 9,5 m.
An indoor swimming pool (25 m) and saunas are also located in the hotel. From the hotel it is just a short walk to Tallinn’s longest beach and jogging tracks in picturesque pine forest.